Here is an interesting motor yacht having its world premier in Dusseldorf, and whose smaller sisters have had a lot of attention in recent years, all for very good reasons in our opinion. 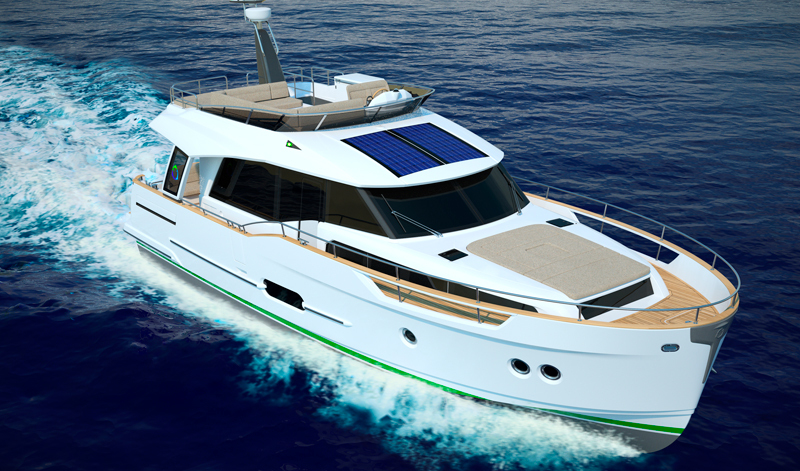 The Greenline Hybrid range of yachts as the name suggests, has a hybrid propulsion system that combines performance with economy, and a healthy dose of ‘feel good factor’ for those who really care about their carbon footprint, but still want to enjoy a decent size seaworthy motor cruiser. In a nutshell, these boats can power along at decent speeds (+- 15 knots) on a modern Volkswagen marine diesel engine, or switch seamlessly to electric mode allowing no-cost and emission-free sailing at low speeds (up to 3,5 knots.) The combination of the large rooftop solar panel, and a fully electronically managed and maintenance-free electric motor/generator, which can also be charged from the shore power, has proved itself very effective and popular on the established Greenline 33 and 40 models. But now here comes the Greenline 48, with the same distinctive modern lines as her stable mates, but obviously a lot more space and some very comfortable accommodation, with a bright, clean looking, no-nonsense layout! One of the things we have noticed about all the Greenlines is how they make the best use of space. 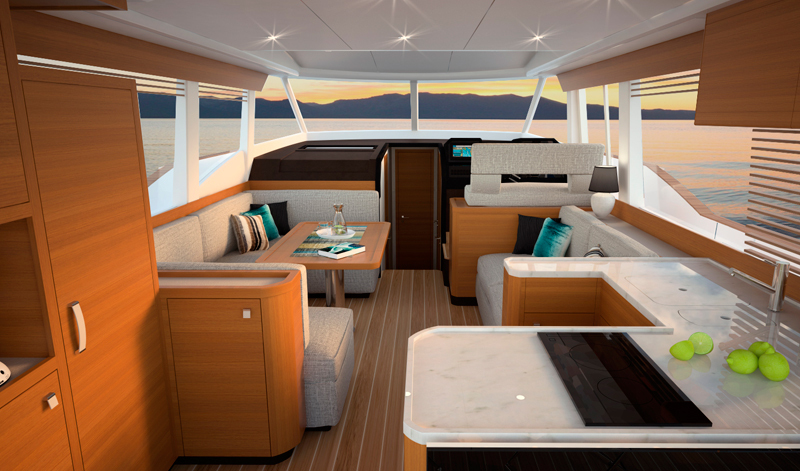 For instance the owners cabin features a ‘scissor design’ split bed arrangement, meaning that two single berths can be slid easily to port and starboard, or back to midships forming an instant double bed, with loads of walk around space either side…simple but very effective! And the practical comforts onboard are backed up by some cool technology, for instance; The GreenPad is an iPad application that has been specially developed for the Greenline range of yachts. Wirelessly collecting data from the Green- Box in the engine room, it graphically shows the status of all the onboard systems on the iPad. 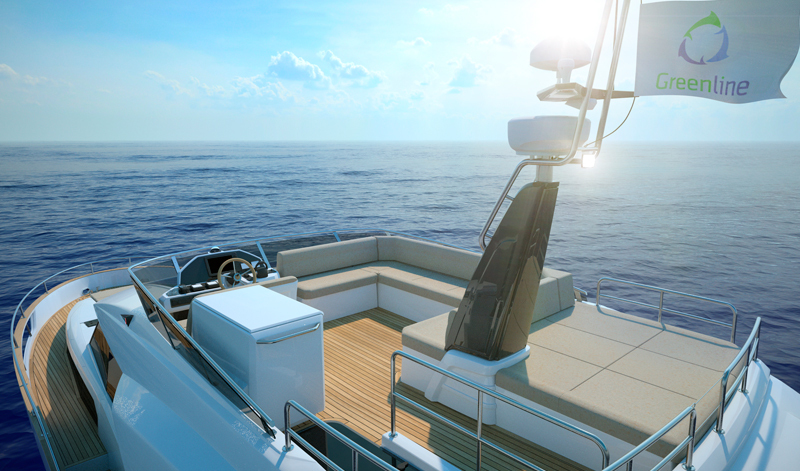 All the boat data is presented through a user-friendly interface, which the boat owner can customise to his preference by dragging, dropping and zooming various data fields to where he wants them.